Earthquake Shakes Central Oklahoma, One Of 7 In 28 Hours : The Two-Way An earthquake of preliminary magnitude 4.2 hit Wednesday night. Earthquakes used to be rare in Oklahoma. Scientists say they're linked to the disposal of wastewater from fracking. 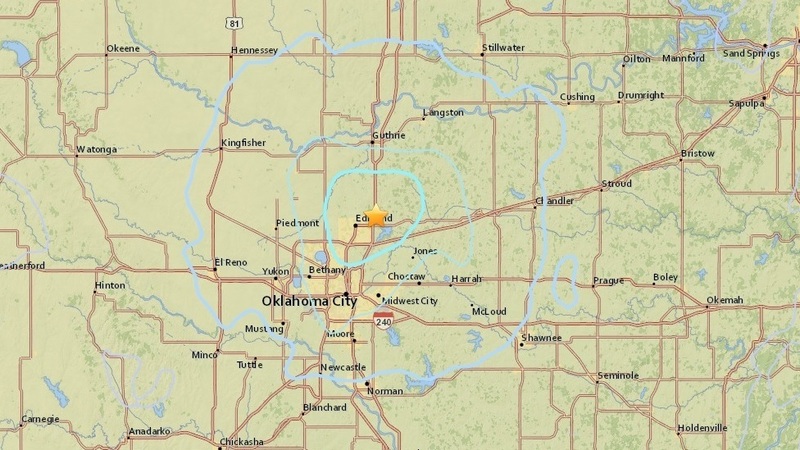 The U.S. Geological Survey shows the location of Wednesday's earthquake in central Oklahoma. An earthquake of preliminary magnitude 4.2 hit central Oklahoma on Wednesday night, the U.S. Geological Survey said, the sixth earthquake to affect the area in just over 24 hours. Four hours later, a less intense earthquake of a preliminary magnitude 3.5 struck the area in the early hours of Thursday. The quake late Wednesday was the largest magnitude earthquake to strike the area, near the city of Edmond, since Tuesday night. 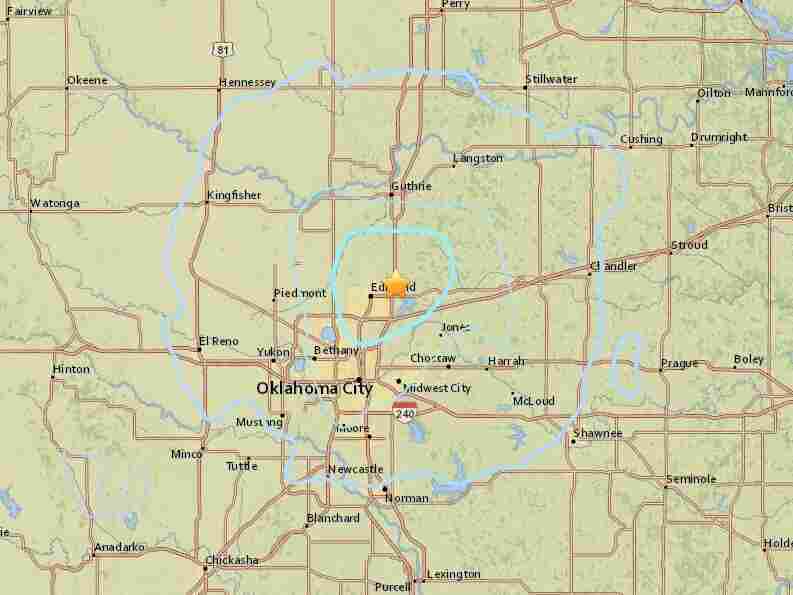 The USGS said the earthquake was "widely felt" in Edmond and northern Oklahoma City, which is located about 15 miles away. It happened a few minutes before 10 p.m. local time at a preliminary depth of 2.3 kilometers (1.43 miles). The Edmond police department said on Twitter that no significant damage had been reported. Residents said the "earthquake cracked floors and walls, and knocked household items off shelves and counters," reporter Joe Wertz of StateImpact Oklahoma reports for NPR. That was the biggest earthquake I've ever felt. Never want to experience that again. Around 1.3 million people live in the greater affected area, Reuters reported, though the population of Edmond alone is only around 90,000. The city said on Twitter that two power substations were affected by a power outage and "large areas of east and northeast Edmond" had lost power. Oklahoma City's News9 said more than 4,600 people lost power. Shortly after 11 p.m. local time, the city said all power had been restored. Since Tuesday night, the USGS reported five earthquakes of magnitudes between 3.0 and 3.5, each located in the same area about 4 miles east-northeast of Edmond. Another earthquake struck earlier Wednesday with a magnitude of 2.6. "Felt indoors by many, outdoors by few during the day. At night, some awakened. Dishes, windows, doors disturbed; walls make cracking sound. Sensation like heavy truck striking building. Standing motor cars rocked noticeably." Oklahoma experienced one of its biggest earthquakes in state history last year, measured at a 5.6 magnitude. Earthquakes in Oklahoma used to be rare and are a recent phenomenon. Scientists have linked earthquakes to the disposal process of wastewater from hydraulic fracturing, or fracking. "Seismic activity has surged in recent years," Wertz says. "Scientists link the quake boom to the widespread oil industry practice of pumping waste fluid into underground disposal wells." But Wertz reports that the quakes have become less frequent since regulators introduced new restrictions on disposal wells.